Book News: Author And Wife Of Amazon CEO Defends Online Retailer : The Two-Way Also: Scottish science fiction writer Iain Banks says he has late stage gall bladder cancer and likely won't live into 2014; a blog calculates the price of Hogwarts Castle; some unfounded literary rumors; and the "politically subversive" poem at the base of the Statue of Liberty. 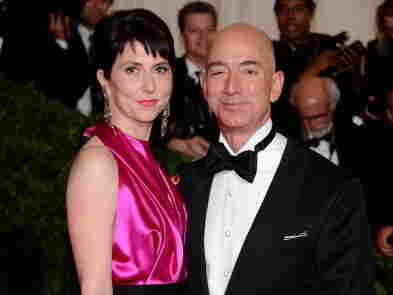 Mackenzie Bezos, the author of the novel Traps and the wife of Amazon founder Jeff Bezos, defended the company publicly for the first time to The Times [paywall protected], calling it "great for authors and books." She herself is not published by Amazon. Iain Banks, the popular Scottish author, announced in a blog post on Wednesday morning that he has late stage gall bladder cancer, and that "it's extremely unlikely I'll live beyond a year." Banks is known for being a prolific author of science fiction novels. The Telegraph wrote of him in 2012, "No other writer likes explosions quite as much as Iain Banks does. His science-fiction novels rock with them, and one of the most celebrated opening sentences in modern literature is (from his 1992 novel The Crow Road): 'It was the day my grandmother exploded.'" In the LA Review of Books, Alexandra Socarides explicates the "formally stunning, politically subversive, yet oddly forgettable poem" at the base of the Statue of Liberty. A real estate blog calculates the value of Hogwarts Castle and comes up with $204.1 million. "Mary Gaitskill's great-great-grandfather invented the beer helmet." and other literary rumors from Vice magazine. The New York Review of Books highlights W.H. Auden's submissions to the literary magazine in honor of National Poetry Month, including his poem "Filler" : "The Marquis de Sade and Genet / Are most highly thought of to-day; / But torture and treachery / Are not my sort of lechery, / So I've given my copies away."